Edison International is helping students achieve their college dreams by providing $40,000 scholarships to 30 deserving students. At the end of March, some of those students learned they had been selected as Edison Scholars with surprise visits at their schools. Others received Skype call surprise announcements. 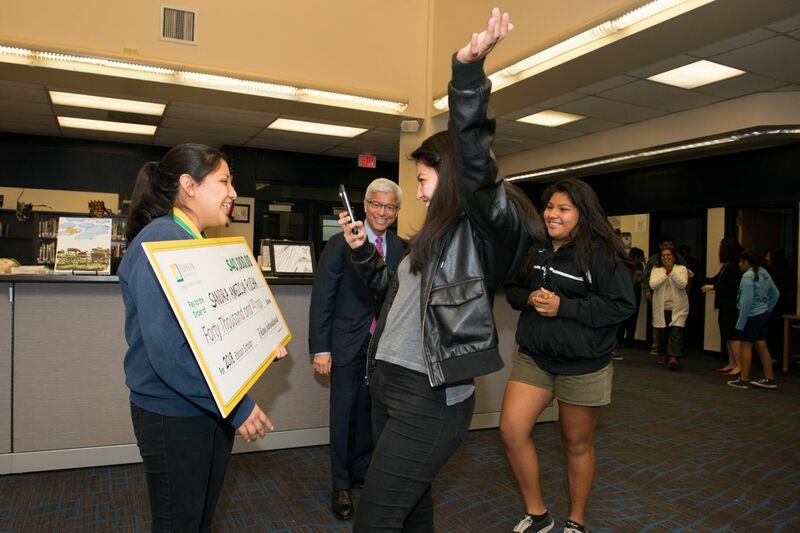 In total, these 30 students from throughout Southern California Edison's service territory were chosen for their academic success and demonstrated financial need. All are pursuing careers in STEM (science, technology, engineering or math). From Tulare to South El Monte, these high school seniors are determined to succeed and make this world a better place for everyone. Since 2006, Edison International has awarded more than $8.7 million in scholarships to 610 Edison Scholars. See all 30 winners and their videos in the interactive map below. 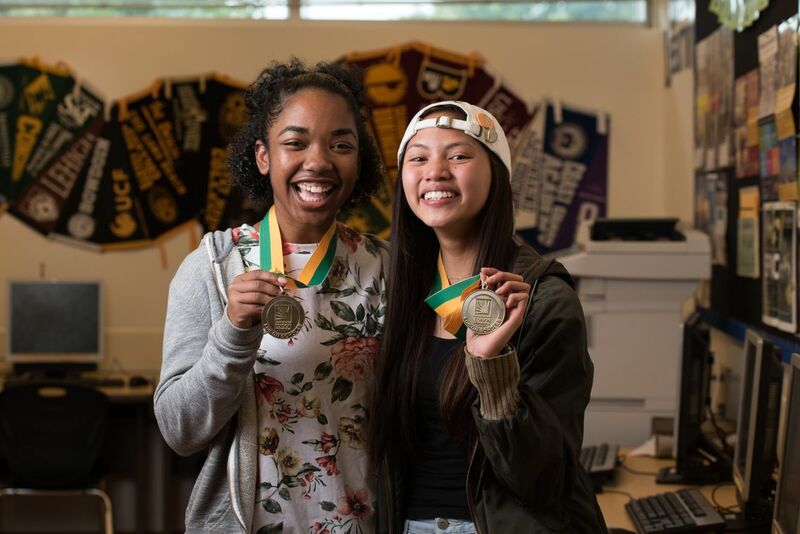 Best friends Shavonna Jackson (left) and Avey Songco, seniors at the California Academy of Mathematics and Science in Carson, pose with their Edison Scholar medals. At 13, Avey Songco was diagnosed with moderate scoliosis requiring a back brace for three years that was a constant source of pain, irritation and discomfort. Her best friend, Shavonna Jackson, grew up not understanding why her father regularly stuck himself with needles. She later learned he had Type 2 diabetes. The two seniors at the California Academy of Mathematics and Science in Carson share an unshakeable bond that even includes stints as Miss Teen Carson — Avey in 2015 and Shavonna last year. And their personal health challenges raised an awareness in each that put them on STEM educational paths and both were recently named 2018 Edison Scholars and the recipients of $40,000 scholarships. Edison Scholar Sandra Amezcua Rocha is congratulated by her sister Isaura. Sandra Amezcua Rocha, 17, grew up in South El Monte in a two-bedroom home where she shared one bedroom with four of her siblings. The rows of large trash bins that line the alleyways outside her apartment and their recyclables are what inspired her to become an environmental activist. It is between these concrete walls that make up her neighborhood that her passion first grew for a future with clean, renewable energy for everyone. Now, she is determined to use education to pursue environmental studies or engineering and bring back what she learns to her community. “Coming home and seeing my family exhausted, I knew the only way out is to get an education,” said Sandra, a senior at South El Monte High School, who would find refuge in the school’s library to finish her homework and projects. 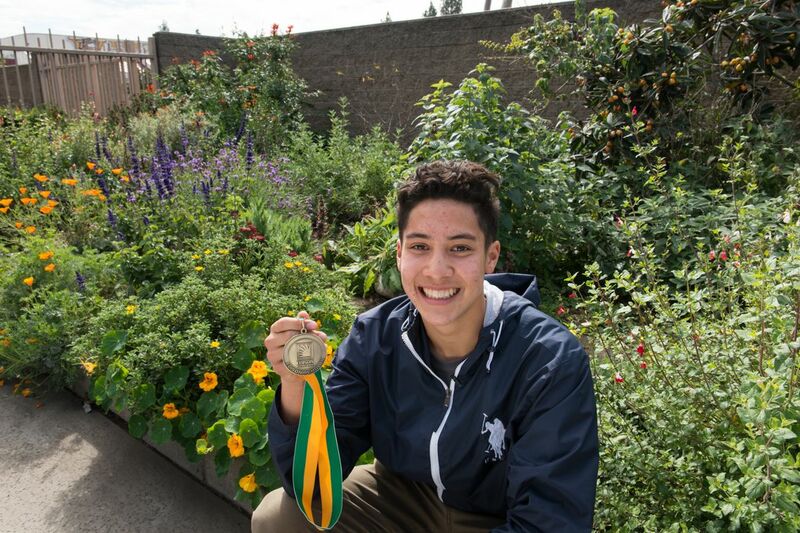 Edison Scholar Justin Hogenauer in front of a sustainable garden he helped build at his school. Alan is recognized by the Guinness World Records as the first person to visit all U.S. national parks and Justin, a Junior Ranger, has himself visited more than 100 of them. Sadly, Alan passed away in 2013 and Justin, now 17, has continued their shared love of traveling. Seeing the beauty of America’s parks has also influenced Justin’s future career choice: environmental studies. “My dad loved nature and as a kid I visited our national parks. I want to preserve our natural resources for future generations,” said the senior at Whitney High School in Cerritos. The $1.2 million program awards $40,000 scholarships, paid over four years, to 30 high school seniors who live in SCE’s service area. Applicants must have at least a cumulative 3.0 GPA, show financial need, and plan to pursue studies in the STEM fields at a four-year accredited college or university. Students from underserved communities and ethnic minorities are encouraged to apply. Applications for the 2019 Edison Scholars scholarships will be available in the fall of 2018. Check back here for details.